Convenient to nearby attractions such as the Denver performing arts Complex, Larimer Square, The Aquarium, The Colorado Convention Center. The Westin Tabor Center and Coors Field. Close to the Adam's Mark Hotel, Brown Palace Hotel, Oxford Hotel, Magnolia Hotel and the Denver Marriot Center. For whatever reason, business or pleasure, day or night, Morton’s private Boardrooms, allow you to Savor the Good Life behind closed doors. Leave a lasting impression on your guests—whether it is for your closest friends or esteemed colleagues, rest assured your private Boardroom experience will be something they will not soon forget. Each Morton’s location has a dedicated Sales ands Marketing Manager who will take charge of every last detail to make your event a seamless success. From the time you book a Boardroom until the final toast is made and your last guest leaves, Morton’s Sales and Marketing Manager will cater to your every need. Sophisticated elegance, privacy and the classic steakhouse experience mark every function held in Morton’s Boardrooms worldwide. Business or pleasure; high energy or laid back, the feeling is always comfortable amid rich mahogany and crisp white linens for business dinners and seminars or celebrations and special occasions. 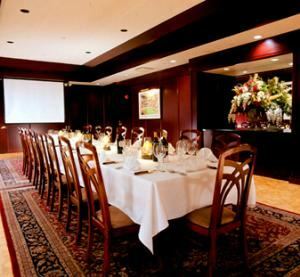 A Boardroom Sales and Marketing Manager in each restaurant welcomes groups of 15 to 100 to exceptional wine, USDA prime-aged beef and personal attention to every detail from AV equipment needs to special entertainment requests.